York, Maine, Selectmen Refuse to Put Legalization Initiative on Ballot, But… Town selectmen voted against putting the initiative from Citizens for a Safer Maine on the November ballot, but since petitioners have already gathered sufficient signatures to force the issue, they can get their petition notarized to be placed on the ballot. York will join Lewiston and South Portland in voting on initiatives this year; Portland approved one last year. Charlotte's Web Medical Hemp Act Picks Up More Sponsors. The Charlotte's Web Medical Hemp Act (HR 5226), which would exclude cannabidiol (CBD) from the definition of marijuana, has gained new sponsors. It now has 19 cosponsors -- 11 Democrats and eight Republicans. The latest are Reps. Ann Wagner (R-MO), Matthew Cartwright (D-PA), and Chris Stewart (R-UT). Georgia Advocates Call for Whole Plant Medical Marijuana, Not Just CBD Oil. As legislative hearings in Macon continue to examine the use of CBD oil, medical marijuana advocates are calling for whole plant medical marijuana. "The cannabis plant contains many compounds that have proven to be effective in treating a variety of conditions," said Georgia C.A.R.E director James Bell. "We should not be determining who can and cannot benefit from this healing plant." Civil Asset Forfeiture Act Picks Up New Sponsors. The bill, HR 5212, now has five cosponsors. The latest are Reps. Stevan Pearce (R-NM), Cynthia Lummis (R-WY), and Reid Ribble (R-WI). All cosponsors so far are Republicans. The bill, filed by Rep. Tim Wahlberg (R-MI), would increase citizen protections against federal asset forfeiture actions. Feds Raid LA Fashion District in Cartel Money Laundering Probe. More than a thousand law enforcement officers spread out across LA's fashion district Wednesday, raiding more than 60 warehouses, storefronts, and residences, arresting nine people and seizing $65 million in cash that they said was being laundered for Mexican drug trafficking organizations. The feds called the mass bust Operation Fashion Police. OAS Head Claims Regional Consensus on Drug Reform. Speaking in front of the Inter-American Dialog in Washington, DC, Organization of American States (OAS) Secretary General Jose Miguel Insulza said Wednesday that regional leaders have reached consensus on four drug policy reform issues: to emphasize a public health approach, to seek out alternatives to incarceration, to stay strong against organized crime, and to work on strengthening regional institutions. Insulza's remarks come ahead of an OAS Special General Assembly to be held in Guatemala next week. Mexico's First Coca Plantation Discovered in Chiapas. Mexican soldiers have seized more than 1,600 coca plants being cultivated in southern Chiapas state, near the Guatemalan border. Mexican military and UN Office on Drugs and Crime (UNODC) officials said it was the first time coca planting had been discovered in the country. "It's a pretty troubling discovery," said UNODC Mexico representative Antonio Mazzitelli. It could amount to "a small-scale experiment to see if there is a possibility of replicating" coca production in Mexico. 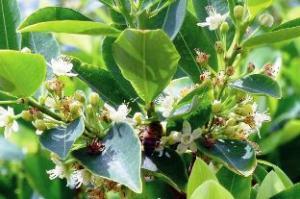 Coca is currently grown only in the Andes, although there is nothing stopping it from being cultivated elsewhere. Saudi Arabia Beheads Another Drug Offender. Authorities in Saudi Arabia Tuesday beheaded a Pakistani national convicted of smuggling "a large quantity of heroin." They have executed at least seven other drug traffickers in recent weeks, and 49 people overall so far this year. It's unclear how many of the 49 were drug offenders. Santa Fe, New Mexico, Decriminalization Initiative Qualifies for Ballot. The Santa Fe city clerk has determined that an initiative to decriminalize marijuana possession in the city has qualified for the November ballot. Now the city council must either vote to change the city ordinance or send the measure to the voters. This measure will eliminate jail time for the possession of less than 1 ounce of marijuana and possession of marijuana paraphernalia for personal use and will result in no more than a simple $25 fine, as well as make marijuana possession the lowest priority for the Santa Fe Police Department. Oklahoma Initiative Effort Will Fall Short, Organizers Concede. There will be no medical marijuana initiative in the Sooner State this year. Saturday was the deadline for handing in signatures, and organizers concede they don't have enough valid signatures. They vow to be back at next year. Hawaii Medical Marijuana Events Slated. The Drug Policy Forum of Hawaii and the American Civil Liberties Union of Hawaii (cofounders of the Medical Cannabis Coalition of Hawaii) have announced three free public events on medical marijuana policy next weekend. "Policy Perspectives on Medical Marijuana" will take place in Oahu and Hilo, while a talk session will be held in Kona. Click on the link for more details. Georgia County Won't Pay Medical Bills for Toddler Injured in SWAT Raid. Habersham County, Georgia, says it will not pay the hospital bills for Bounkham "Baby Boo Boo" Phonesavah, the 19-month-old toddler severely burned when a SWAT team executing a drug arrest warrant threw a flash-bang grenade into his home during a May drug raid. The person the police were looking for wasn't there. Look for a civil lawsuit. Tampa Police Review Finds No Problem With SWAT Team Killing of Man in Minor Marijuana Raid. SWAT team members acted appropriately when they shot and killed 29-year-old Jason Westcott during a May drug raid, a Tampa Police internal review has found. Police entered the residence where Westcott and a roommate were sleeping, then encountered him with a handgun in the bathroom, where they shot and killed him. Police seized less than $2 worth of marijuana at the scene. There are problems with the investigation that led to the raid, too; click on the May drug raid link to read more. New York Governor Candidate Randy Credico Arrested, Jailed for Making Video of Cops Arresting Black Man in Subway. Randy Credico, challenger to incumbent Gov. Andrew Cuomo in next month's Democratic primary, was arrested and jailed for videotaping undercover transit police aggressively arresting a black man Friday afternoon. He is charged with menacing a police officer, obstructing government administration and resisting arrest and disorderly conduct. Credico has been arrested more than 20 times, mostly for civil disobedience actions or videotaping police activities. Justice Department Ups the Ante on FedEx with New Money Laundering Charges. Federal prosecutors in San Francisco unveiled a new indictment against FedEx last Thursday that adds money laundering to a list of charges alleging that the delivery company knowingly shipped illegal prescription drugs from two online pharmacies. The company was already facing 15 conspiracy and drug charges and is looking at a fine of up to $1.6 billion if found guilty. UPS paid the feds $40 million last year to settle similar charges. RAVE Act Has Done More Harm Than Good, Study Finds. 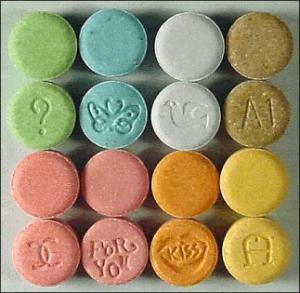 The 2003 RAVE Act (Reducing Americans' Vulnerability to Ecstasy Act) has not reduced the drug's popularity, but has instead endangered users by hampering efforts to protect them. The law held club owners and produces criminally responsible for drug use at their events, and that made them disinclined to provide harm reduction services -- providing free bottled water of allowing groups like DanceSafe to do informational flyering or drug testing -- because that could be used as signs they were aware of drug use. "There were a lot of groups like that, and there was a lot of educational information about drugs being made available," study author University of Delaware sociologist Tammy Anderson said. "Today, clubs and promoters are reluctant to take those precautions because it could be used as evidence against them. The RAVE Act is a relic of the War on Drugs," she said. "It never worked in the past, and it's not working now." Her research was presented Sunday at the American Sociological Association annual meeting in San Francisco. Vietnam Sentences Six to Death for Heroin Trafficking. A court in northern Vietnam sentenced six people to death last Thursday for trafficking Laotian heroin destined for China. The six were convicted of trafficking 240 pounds of the drug. Under Vietnamese law, the death penalty can be imposed for offenses involving as little as 3.5 ounces of heroin. Barcelona to Shut Down Dozens of Cannabis Clubs. The city of Barcelona moved quietly last week to shut down about a third of the city's 145 cannabis clubs, citing "deficiencies" in management at nearly 50 of them. Those "deficiencies" included the illegal sale of marijuana, trying to attract non-members to their premises, and creating problems for the neighborhoods where they operate. Under Spanish law, the clubs can operate as members-only establishments where participants share their collective crops. The Spanish Federation of Cannabis Associations has asked for better regulations to avoid illegal practices. Ecstasy seems to be making a comeback. Denver City Council Now Considering Cultivation Restrictions. Just when you thought it was safe again, after an effort to stop people from smoking marijuana on their own property in public view died Monday night, the Denver city council is now considering an effort to cap the number of plants that can be grown in a single household. The measure is sponsored by Councilwoman Jeanne Robb, the same person behind the failed private property smoking ban. The measure would be in conflict with Amendment 64, which is now part of the state constitution and clearly says anyone 21 or older can grow six plants "notwithstanding any other provision of law." California US Senator, Representatives Seek Tougher Penalties for Federal Lands Marijuana Grows. Several California congressmen, including some who have been strong supporters of medical marijuana, have written a letter to the US Sentencing Commission seeking longer prison sentences for people growing on federal and some private lands. "We are concerned that existing guidelines do not address the long term detrimental threats these operations pose to the environment and nearby communities," the letter said. "The production and cultivation of controlled substances in particular marijuana, on public lands or while trespassing on private property is a direct threat to our environment and public safety." The signatories include Sen. Dianne Feinstein and US Reps. Doug Amalfa, Sam Farr, Jared Huffman, and Mike Thompson. Bill Clinton Says Attitudes Toward Drug Legalization Are Changing. Attitudes toward drug legalization are changing, former President Bill Clinton said in an interview with Fusion TV Tuesday. "The drug issue should be decided by people in each country, based on what they think is right," the ex-president opined. "We have a process in America for doing it that's being revisited state-by-state. And Latin America is free to do the same thing. It's obvious that attitudes are changing and opening up," he said. But he added that he didn't think hard drugs should be treated like marijuana. "It's also too complicated to say that if you legalize it, you wouldn't have any of these armed gangs trying to exercise a stranglehold over whole communities and lives, or that we could actually get away with legalizing cocaine and then the criminals would go away," he said. Vermont Chief Justice Criticizes Drug War, "Tough on Crime" Approach. Vermont Chief Justice Paul Reiber has lashed out at the war on drugs and "tough on crime" approaches in general in a pair of recent speeches and a television interview. "Even with our best efforts, we are losing ground," Reiber told a crowd at Vermont Law School last month. "The classic approach of 'tough on crime' is not working in this area of drug policy. The public responds very well to this 'tough on crime' message, but that does not mean it's effective in changing individual behavior. If the idea is law enforcement alone will slow and eventually eliminate drug use altogether, that isn't going to happen… The criminal justice system can't solve the drug problem." Teen Ecstasy-Related Hospital ER Visits Doubled in Recent Years, Feds Say. The Substance Abuse and Mental Health Services Administration (SAMHSA) reported Tuesday that hospital emergency room visits linked to teen Ecstasy use had more than doubled between 2005 and 2011. The number jumped from about 4,500 to more than 10,000 during that period. One third of those cases also involved alcohol. Authorities worry the club drug is making a comeback, although the number of ER visits reported for ecstasy is a tiny fraction of the 1.5 million drug-related ER visits reported each year. Morocco Parliament Holds Hearing on Legalizing Cannabis for Hemp, Medical Marijuana. Morocco's Party for Authenticity and Modernity held a historic hearing Wednesday about legalizing marijuana cultivation for hemp and medical marijuana. The party hopes to introduce legislation next year. Somewhere between 750,000 and a million Moroccans depend on the cannabis crop for a living, although lawmakers said small farmers currently reap very little profit, with most profits going to drug traffickers sending Moroccan hash to Europe. Former Mexican Border State Governor Charged in US with Money Laundering for Cartels. Tomas Yarrington, the former PRI governor of Tamaulipas state, across the Rio Grande from Brownsville and McAllen, Texas, has been indicted by US authorities on charges he took millions in bribes from the Gulf Cartel. Prosecutors allege Yarrington started receiving bribes while running for governor of the state in 1999 and continued to do so throughout his term. He is being sought by US authorities, but has not been taken into custody in Mexico. 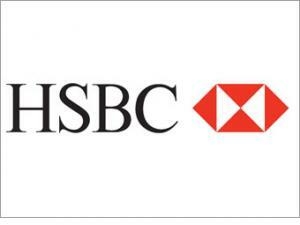 The London-based HSBC Group, Europe's largest banking entity, has agreed to forfeit $1.256 billion and pay an additional $600 million-plus in fines for laundering money for Mexican drug cartels and other objects of American ire, federal officials announced Tuesday. The agreement was part of a deal to avoid criminal prosecution of the bank by the Justice Department and will result in deferred prosecution provided the bank lives up to its agreements with the Justice Department. The bank was accused of violating the Banking Secrecy Act, the International Emergency Economic Powers Act, and the Trading with the Enemy Act -- the latter two types of violations having to do with its transactions on behalf of customers in Cuba, Iran, Libya, Sudan, and Burma, all of which were subject to sanctions enforced by the Office of Foreign Assets Control at the time of the violations. The Banking Secrecy Act violations have to do with the banks laundering of at least $881 million for Mexican drug trafficking organizations. "HSBC is being held accountable for stunning failures of oversight -- and worse -- that led the bank to permit narcotics traffickers and others to launder hundreds of millions of dollars through HSBC subsidiaries, and to facilitate hundreds of millions more in transactions with sanctioned countries," said Assistant Attorney General for Criminal Affairs Lanny Breuer. "The record of dysfunction that prevailed at HSBC for many years was astonishing. Today, HSBC is paying a heavy price for its conduct, and, under the terms of today's agreement, if the bank fails to comply with the agreement in any way, we reserve the right to fully prosecute it." "Today we announce the filing of criminal charges against HSBC, one of the largest financial institutions in the world," said US Attorney for Eastern New York Loretta Lynch. "HSBC’s blatant failure to implement proper anti-money laundering controls facilitated the laundering of at least $881 million in drug proceeds through the US financial system. HSBC's willful flouting of US sanctions laws and regulations resulted in the processing of hundreds of millions of dollars in OFAC-prohibited transactions. Today's historic agreement, which imposes the largest penalty in any BSA prosecution to date, makes it clear that all corporate citizens, no matter how large, must be held accountable for their actions." HSBC may have been slapped with the largest penalties ever, but it is hardly the only bank to have been caught profiting off prohibition. 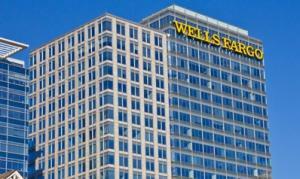 In 2010, Wachovia forfeited $110 million to avoid criminal prosecution for money laundering for the cartels, Sigue Corporation forfeited $15 million in 2008, American Express International Bank paid $65 million in fines and Union Bank of California forfeited $21.6 million in 2007, and Bank Atlantic paid a $10 million fine to avoid prosecution for laundering drug cartel profits in 2006. Like HSBC, all of those banks agreed to reform their banking practices and submit to federal oversight as part of the agreement. HSBC is accused of under-staffing its anti-money laundering program and failing to monitor billions of dollars in purchases of physical dollars by its Mexican affiliate, HSBC Mexico. It reportedly failed to monitor over $670 billion in wire transfers and the purchase of over $9.4 billion in US dollars. According to the Justice Department, "HSBC Mexico's own lax AML controls caused it to be the preferred financial institution for drug cartels and money launderers." The unanswered question is why a government that lets bankers who launder hundreds of millions of dollars of drug profits routinely sends crack-slingers to federal prison for decades for selling a few dollars worth of drugs. Perhaps if those drug dealers had a few million dollars they could hand over to the feds, they could walk, too. Last Thursday, the White House released its annual determination of major drug trafficking or producing countries, the "majors," singling out Bolivia, Burma, and Venezuela as countries that have failed to comply with US drug policy demands. That has sparked sharp and pointed reactions from Bolivia and Venezuela. "I hereby designate Bolivia, Burma, and Venezuela as countries that have failed demonstrably during the previous 12 months to make substantial efforts to adhere to their obligations under international counter-narcotics agreements," President Obama said in the determination. That marks the fourth year in a row the US has singled out Bolivia and Venezuela, which are left-leaning regional allies highly critical of US influence in Latin America. But while the US has once again put the two countries on its drug policy black list, it is not blocking foreign assistance to them because "support for programs to aid Bolivia and Venezuela are vital to the national interests of the United States." Despite that caveat, Bolivia and Venezuela were having none of it. "Venezuela deplores the United States government's insistence on undermining bilateral relations by publishing this kind of document, with no respect for the sovereignty and dignity of the Venezuelan people," the Venezuelan Foreign Ministry said in a communique last Friday. Venezuela "rejects in the most decided manner the accusations of the government of the United States," the communique said, adding that the presidential determination is "plagued with false statements, political preconceptions and veiled threats," which only repeat its "permanent line of aggression against independent sovereign governments." Venezuela also counter-punched, accusing the US of allowing "a fluid transit" of drugs across its borders" and "the laundering of capital from drug trafficking through the financial system." "The government of the United States has become principally responsible for this plague that is the scourge of the entire world," it said. The foreign ministry added that Venezuela's anti-drug efforts improved after it kicked out the DEA in 2005, that it has been free of illegal drug crops since 2006, and that it has actively pursued leading drug traffickers, including 19 it had extradited to the US since 2006. Bolivian President Evo Morales, for his part, said the US, home of the world's largest drug consumer market, had no grounds on which to criticize other countries about its war on drugs. "The United States has no morality, authority or ethics that would allow it to speak about the war on drugs. Do you know why? 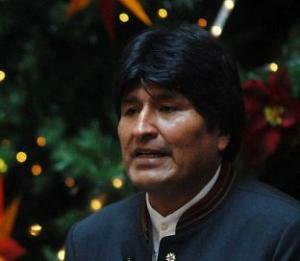 Because the biggest market for cocaine and other drugs is the United States," Morales said in a Saturday speech. "They should tell us by what percentage they have reduced the internal (drug) market. The internal market keeps growing and in some states of the United States they're even legalizing the sale of cocaine under medical control," the Bolivian president said. It's unclear what Morales was trying to say with that latter remark. Although as a Schedule II drug, cocaine can be and occasionally is used medically in the United States, there are no current moves by any US state to take that further. Some 17 US states and the District of Columbia have, however, moved to legalize the distribution of marijuana under medical control. "I'm convinced that the drug trade is no less than the United States' best business," Morales added, noting that since the first international drug control treaties were signed in 1961, drug trafficking has blossomed, not declined. He said he has suggested to South American leaders that they form a commission to report on how well Washington is doing in its war on drugs. Morales also took the occasion to lambaste the US for opposing Bolivia's request before the United Nations to modify that 1961 treaty to acknowledge that chewing coca leaf is "an ancestral cultural practice" in the Andes. Like Venezuela, Bolivia protested that it, too, has been fighting drug trafficking. The Bolivian government said that it had seized 182 tons of cocaine since Morales took power in 2006, compared to only 49 tons confiscated in the previous five years. Bolivia has seized 31 tons of cocaine so far this year, most of it from Peru, the government said. The US presidential determination named the following countries as major illicit drug producing or trafficking countries: Afghanistan, the Bahamas, Belize, Bolivia, Burma, Colombia, Costa Rica, the Dominican Republic, Ecuador, El Salvador, Guatemala, Haiti, Honduras, India, Jamaica, Laos, Mexico, Nicaragua, Pakistan, Panama, Peru, and Venezuela. Last Sunday, dozens of Mexican activists led by poet Javier Sicilia crossed into the US at San Diego to begin a weeks-long Caravan for Peace and Justice that will take them more than 6,000 miles through 27 cities in a bid to focus attention on the drug war's terrible toll in both countries. They were met there by representatives of the more than 100 US organizations that are joining and supporting the Caravan as it makes its way toward Washington, DC. "Our purpose is to honor our victims, to make their names and faces visible," Sicilia said. "We will travel across the United States to raise awareness of the unbearable pain and loss caused by the drug war -- and of the enormous shared responsibility for protecting families and communities in both our countries." Drug War policies: We propose the need to find a solution, with a multidisciplinary and intergenerational approach that places individuals, and their welfare and dignity, at the center of drug policy. We call on both the Mexican and the U.S. community to open and maintain a dialogue about alternatives to Prohibition based on evidence, and which is inclusive in its considerations of the diverse options for drug regulation. Arms trafficking: We propose that the President of the United States immediately prohibit the importation of assault weapons to the United States. Assault weapons are often smuggled into Mexico, and have also been used too many times against innocent civilians in the US. We propose giving authorities effective regulatory tools and adequate resources to halt arms smuggling in the border regions, especially in border states like Arizona and Texas. Money laundering: We call for governments on both sides of the border to take concrete steps to combat money laundering. We propose that financial institutions be held accountable for preventing money laundering through increased government surveillance, investigations, fines and criminal charges. We also call for the Treasury Department to immediately implement Congress’ 2009 call to close the “prepaid/stored value cards” loophole. US foreign aid policy: We call for a change from the United States' "war" focus to one of human security and development that contemplates promoting the healing of Mexico's torn social fabric. We propose the immediate suspension of US assistance to Mexico's armed forces. The "shared responsibility" for peace that both governments share must begin with each country complying with its own respective national laws. Immigration: We call for a change in the policies that have militarized the border and criminalized immigrants. These policies have generated a humanitarian crisis driven by unprecedented levels of deportations and incarceration of migrants. In addition, these policies have also inflicted immeasurable environmental damage. We call for protecting the dignity of every human being, including immigrant populations that have been displaced by violence who are fleeing to the US seeking safe haven and a better life. The Caravan is a natural outgrowth of Sicilia's Mexican Movement for Peace and Justice with Dignity (MMPJD), which he formed after his son and several comrades were kidnapped and murdered by drug cartel gunmen in Cuernavaca in March 2011. It is designed to put names and faces on the estimated 60,000 dead, 10,000 disappeared, and 150,000 displaced by the prohibition-related violence pitting the so-called cartels against each other and the Mexican state. In Mexico, the MMPJD struck a deep chord with a population increasingly angered and frightened by the often horrific violence raging across the country. Caravans organized by the MMJPD crisscrossed the country last year before bringing 100,000 people to mass in Mexico City's huge national plaza, the Zocalo in June. The mass outpouring of grief and anger convinced President Felipe Calderon to meet with Sicilia, who brought along photos of some of the dead depicting them as happy, smiling human beings. "The powers that be were trying to tell us that all those who were dying were just criminals, just cockroaches," Sicilia explained. "We had to change the mindset, and put names to the victims for a change." On last Sunday, Sicilia and the Caravan were met in San Diego by about 100 supporters from national groups such as the Drug Policy Alliance, Global Exchange, Law Enforcement Against Prohibition, the NAACP, the Washington Office on Latin America, and, as will be the case across the country, local immigrant rights, civil rights, religious, and drug reform groups. "This movement brings together activists from both of our countries to shed light on the policies that have failed our families, neighbors, and nations," said Sicilia. "United, we will raise our voices to call for an end to a war on drugs that allows entire communities to become casualties, and we will demand a shift in attention to poverty and the lack of economic opportunity that helps breed the criminality." "What we are trying to do is raise the level of conversation around this topic," said Global Exchange's Ted Lewis, one of the caravan's organizers. "We're trying to have a bi-national conversation and impact." By last Friday, the Caravan had reached Las Cruces, New Mexico, after first stopping in Los Angeles, Phoenix, and Tucson. In Los Angeles, the Caravan wooed Hollywood, seeking support from the film community as it seeks to shift public opinion against prohibitionist drug policies that wreak havoc in both countries. "What unites us is grief for what Mexico has lost, which is peace," said Mexican filmmaker Alejandro Gonzalez Inarritu, the Oscar-nominated director of "Biutiful" and "Babel," who was among the Hollywood stars greeting the Caravan. In Phoenix on Thursday, Sicilia and the Caravan had an unexpected encounter with Maricopa County Sheriff Joe Arpaio as they trekked to one of Arpaio's jails to see what the drug war looks like on the US side of the border. The feisty sheriff, who is notorious for his treatment of prisoners and anti-immigrant politics, got an earful from Sicilia, but didn't exactly roll over. Sicilia chided Arpaio over the flow of American weapons into Mexico and the hands of the cartels and asked him to do a better job controlling the traffic, to which Arpaio retorted, "Control the flow of drugs." Sicilia also urged Arpaio, who is under Justice Department investigation over his treatment of prisoners and illegal immigrants, to "be more human" in the way he handles people under his control. "We don't come in war but in peace to tell you that you have half of the responsibility for the war that there is in Mexico," he said. "I ask you whether treating migrants like dogs is a correct policy." 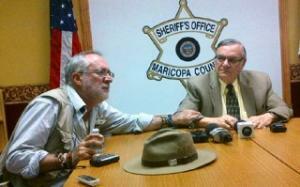 Sicilia urged Arpaio to visit Mexico, but Arpaio demurred, saying that the cartels had a price on his head. 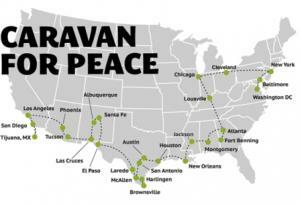 The Caravan for Peace is now less nearly two weeks into its journey across the county to Washington, DC. Organizers have not said yet whether they will seek a meeting with President Obama, but are planning on meetings on Capitol Hill. Between now and then, they hope the Caravan will succeed in raising consciousness among Americans about the toll of the drug war on both sides of the border. Whether policymakers will listen is an open question, but the media is certainly listening. Google lists 145 news articles about the Caravan so far. That's a good start. In Mexico City, the Army announced that troops had dismantled a cartel telecommunications system that spanned four northern states. SEDENA said that troops confiscated 167 antennas, 166 power supplies, 1,400 radios and 2,600 cell phones in the operation, which took place in Nuevo Leon, Coahuila, San Luis Potosi and Tamaulipas. In Ciudad Juarez, at least nine people were murdered in several incidents. Among the dead was a man who was chopped into pieces and scattered around a neighborhood. In another incident, three members of a musical group were gunned down as they rode in a car. In another part of the city, a group of armed men shot a woman dead outside a school. In Ciudad Juarez, an American imprisoned on drug charges was released after American authorities determined that he had been tortured while in Mexican custody. John Huckabee, 24, had been arrested 26 months ago after Mexican authorities discovered marijuana in his car, a charge he denies. He had originally been sentenced to five years. In Tabasco, 22 municipal and ministerial policemen were arrested on suspicion of involvement with the Zetas. The arrests, which took place across four municipalities, came after statements made by Santos Ramirez Morales, "Santo Sapo," a Zetas commander who was captured on November 24th in Chiapas. In Ciudad Juarez, an anti-violence activist was wounded by a gunman. Norma Andrade, 51, was shot twice outside her home in what authorities are calling an attempted robbery. Her daughter, however, told the AP that suspicious men had been asking about her Friday morning. The attack happened later in the afternoon. In Veracruz, seven bound and gagged bodies were discovered. All appear to have been tortured. Military and police forces searched the area after the discovery, but no arrests were made. In Acapulco, six members of the Independent Cartel of Acapulco (CIDA) were captured in a Federal police operation. Among those captured was Gilberto Castrejon Morales "Comandante Gil," the reputed leader of the organization. CIDA has been heavily involved in the violence over drug trafficking in Acapulco this year. 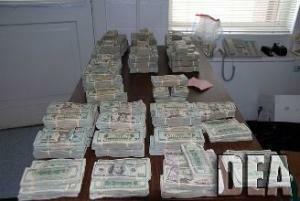 In Washington, Congressional Republicans said they would open an investigation into recent reports that DEA agents have laundered and smuggled millions of dollars in narcotics proceeds in an effort to help identify ways in which cartels launder money, as well as the location of assets and cartel leadership targets.Critics of the operation have said that the DEA tactic comes dangerously close to facilitating criminal activity. The DEA, for its part, said the operations were conducted with the full knowledge and support of the Mexican government. In Monterrey, authorities announced the capture of ten Gulf Cartel gunmen linked to two attacks on local bars which killed a total of 23 died. Ten assault rifles, five vehicles and three grenades were also seized. In Ciudad Juarez, seven people were killed in several incidents. In one incident, a 21-year old man was shot and killed after being chased down by gunmen. In another, a man was shot and killed by gunmen who came to his front door. No witnesses were present, due to the snow and cold weather. American undercover agents, primarily with the DEA, have laundered or smuggled millions of dollars in drug proceeds from Mexican drug trafficking organizations as part of their investigations into how the cartels operate, The New York Times reported Sunday. The newspaper cited "current and former federal law enforcement officials." While the DEA conducts similar operations in other countries, it had not done so in Mexico since 1998, when, after a cross-border drug sting offended Mexican sensibilities, permission for such operations there was rescinded. But that changed after Mexican President Felipe Calderon declared his bloody war against the cartels. The agents took shipments of hundreds of thousands of dollars in cash across borders and deposited them in traffickers' accounts or shell accounts set up to launder the funds. Their activities allowed the cartels to launder funds for months or even years while investigations proceeded. As the Times noted, "The high-risk activities raise delicate questions about the agency's effectiveness in bringing down drug kingpins, underscore diplomatic concerns about Mexican sovereignty, and blur the line between surveillance and facilitating crime." "Building up the evidence to connect the cash to drugs, and connect the first cash pickup to a cartel's command and control, is a very time consuming process," explained one anonymous former DEA official. "These people aren't running a drugstore in downtown LA that we can go and lock the doors and place a seizure sticker on the window. These are sophisticated, international operations that practice very tight security. And as far as the Mexican cartels go, they operate in a corrupt country, from cities that the cops can't even go into." But as the Times noted, "It is not clear whether such operations are worth the risks. So far there are few signs that following the money has disrupted the cartels' operations, and little evidence that Mexican drug traffickers are feeling any serious financial pain. Last year, the DEA seized about $1 billion in cash and drug assets, while Mexico seized an estimated $26 million in money laundering investigations, a tiny fraction of the estimated $18 billion to $39 billion in drug money that flows between the countries each year." 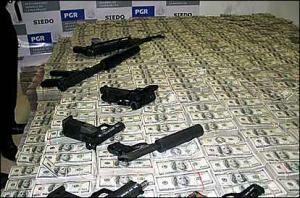 The DEA money laundering operations raise concerns similar to those raised by members of Congress about a Bureau of Alcohol, Tobacco & Firearms (ATF) effort, Operation Fast and Furious, in which ATF allowed low-level smugglers to buy guns in the US and transport them to Mexico in a bid to find higher-ranking cartel operatives. ATF lost track of hundreds of those guns. Some turned up at Mexican crimes scenes and two were found on the US side of the border where a Border Patrol agent had been shot to death. Federal regulators ignited a firestorm of controversy recently when they ordered banks located in the North Coast area of California to spy on transactions of customers who are suspected of making money in the marijuana business. In a bid to crack down on California's marijuana industry, regulators have ordered banks to look out for suspicious activity by those running such operations, but that is leaving legal -- under state, but not federal law -- medical marijuana businesses out in the cold. Although DEA and FBI officials are not specifically targeting medical marijuana, they say they are looking for drug traffickers and money launderers, and they regard any marijuana-related banking activities with suspicion. The banks are not being ordered to not do business with dispensaries, but are instead closing accounts rather than put up with the hassles of investigating and reporting those transactions. Banks in the North Coast region, including Savings Bank, Wells Fargo, the Exchange Bank, and Ukiah Bank, as well as other financial institutions in the Sacramento and San Joaquin areas are scrambling to comply with the government's order as the feds continue their onslaught against the legal marijuana trade. The enforcement action is the result of the North Coast's widespread reputation for marijuana production and also includes the arrest of citizens in the area operating legal medical marijuana businesses under California state law. California voters passed Proposition 215 in 1996, legalizing the medical use of marijuana for patients whose doctors have recommended they use it. According to the Santa Rosa Press-Democrat, the policy took effect last month when the largest bank in Mendocino County informed shareholders that federal banking regulators would now require the North Coast banks to scrutinize deposit accounts because the area had been designated a high-risk area for money laundering, particularly from those in the medical marijuana business. "This area in general has been targeted by Washington because the amount of cash that comes out of here," said Charles Mannon, chief executive of the Ukiah Bank. Mike Johnson, an entrepreneur in the marijuana industry who requested that this article not identify the name of his business, felt the squeeze from the federal regulators when Wells Fargo and the Umpqua Bank closed his accounts last year. "They think we're all drug dealers," Johnson said. Those in the trade familiar with the feds' regulation policy complain of how the government has forced banks and financial institutions to enlist as foot soldiers in the war on drugs. The new requirements force banks to expend unnecessary time and money probing clients' accounts for evidence of illegal activity associated with the marijuana business, they say. 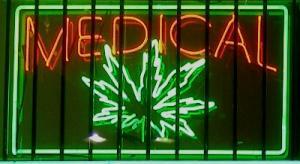 To bypass the stringent rules, several banks closed the accounts of medical marijuana dispensaries. Bank officers said that since medical marijuana is a violation of federal law, they are required under the Bank Secrecy Act to report on businesses involved in the state authorized medical marijuana industry. Last year, Exchange Bank issued a policy which prohibits medical marijuana businesses from opening up accounts because of the time-consuming scrutiny they would have to undergo and because of the expense of having to purchase pricey monitoring systems. "State and federal law are in conflict with each other," said Bill Schrader, president of Exchange Bank. "If there are suspicious activities under federal law, we have to report it." The extensive monitoring of bank accounts works this way: If a bank agent or its anti-laundering system detects suspicious activity, the feds have required banks and credit unions to file a report with the Financial Crimes Enforcement Network (FINCEN), which operate massive databases available to the FBI and DEA. Currently there are 14 states including the District of Columbia allowed to sell medical marijuana legally under state law, but under the federal Controlled Substances Act of 1970, marijuana is classified as an illegal Schedule 1 drug. The federal government cannot force states to comply with federal law or require states to enforce federal law, but the US Department of Justice has the authority to prosecute offenders and organizations in violation of federal law against sales or possession of marijuana. This law effectively blocks banks from dealing with those in the legal marijuana business who must operate business accounts to accept credit and debit cards for their services. "Our organization is regularly contacted by cannabis businesses that can't make daily deposits or have credit card processing," Allen St. Pierre, executive director of NORML, told the Chronicle. "The inability of cannabusinesses to gain access to regular banking and financial services continues to hamper the expansion of medical cannabis dispensaries." St. Pierre took a shot at the Department of Justice. "Despite the 2009 'Ogden' memo from the Obama administration's attempt to allow greater autonomy for states to regulate medical cannabis, the memo didn't address the legal concerns expressed by banks and financial services who fear they are violating federal laws if they do business with cannabis businesses." In May 2010, following several attempts to pass legislation to eliminate federal penalties for medical marijuana, 15 members of Congress, led by Rep. Barney Frank (D-MA) issued a letter written by Rep. Jared Polis (D-CO) to Treasury Secretary Timothy Geithner. "Legitimate state-legal businesses are being denied access to banking services, which does not serve the public interest," the letter said. The letter also requested "formal written guidance" to assure banks would not be federally targeted for conducting business with medical marijuana dispensaries. "They were trying to ensure that medical marijuana dispensaries could have banking services provided to them because there's so much capital involved," said Mike Meno, director of communications for the Marijuana Policy Project. It's not just Northern California. Sue Harank is the co-owner of Alpine Herbal Wellness in Denver Colorado. This medical marijuana dispensary has been operating less than a year. Within this time, Harank has been forced to switch banks four times after the institutions closed her accounts without prior warning. Harank called situation as "one heck of a nightmare." According to Banktime.com, Harank now does business with Colorado State Bank, the only bank in the state allowing people in the legal marijuana trade to hold business accounts. Don Duncan feels the adverse treatment as well, when dealing with financial institutions. Duncan, the California director of the pro-medical marijuana advocacy group Americans for Safe Access, had his bank accounts shut down without notice. "Banks can't figure out if it's okay to do business with medical cannabis organizations," he said. US Attorney General Eric Holder issued a memo in October, 2009, expressing administration policy of not utilizing federal resources to pursue "individuals whose actions are in clear and unambiguous compliance with existing state laws providing for the medical use of marijuana." Despite Holder's direct orders the federal troops still pursue those legally operating marijuana businesses. "It doesn't make sense. It is an un-American thing for the feds to do," said Mike Johnson. "Every major bank in California has been told not to handle marijuana accounts." Legal conflicts surrounding the bank's secrecy laws forcing banks to report customers making suspicious deposits has created a "boom" in business for lesser known financial services. According to Banktime.com, Marijuanapos.com is one of the few institutions to offer banking services, including credit and debit card processing, for legal marijuana businesses. Jesse Cretaro, the marketing director of Marijuanapos.com, said they work with banks that deal with high-risk clients. Another financial service, Direct Bancard of Livonia, Michigan, offers medical marijuana providers a prime-time Cadillac service. Executive Vice President Martin Khemmoro explained that Direct Bancard often uses merchant services located overseas to bypass legal conflicts. Guardian Data Systems offer similar services but deals only with medical marijuana dispensaries legal under California state law. Lance Ott, Guardian's chief executive officer said he's been trying for years "to offer honest and secure services to an emerging industry." Meanwhile dedicated advocates for the medical marijuana industry insist that all they want is for those in the industry to have access to safe and transparent banking services, like other professional entrepreneurs. "All medical marijuana merchants wants to do is obey the law and do what's normal," said Duncan. But that's unlikely to happen as long as federal marijuana prohibition remains intact. While the federal raids on medical marijuana dispensaries have decreased -- if not ended completely -- the feds have demonstrated that they are determined to use all the weapons in their arsenal to continue to go after what they consider to be a criminal industry.